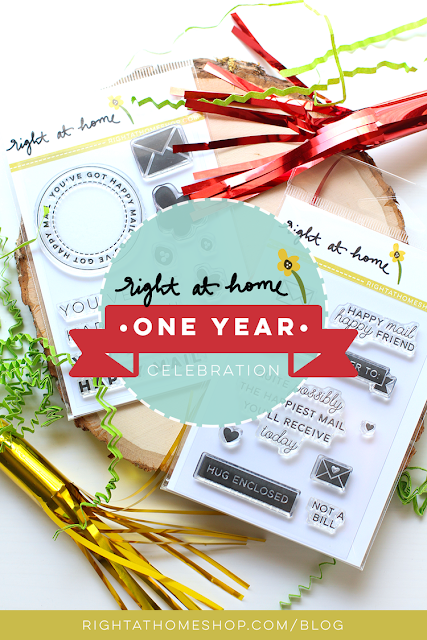 Happy One Year Anniversary to Right at Home! To celebrate, RAH is hosting a fun blog hop, a giveaway and a link-up (info at the end of this post). Congratulations Nicole! I'm so happy to watch your company grow. Nicole released her first stamp set, Happy Mail, a year ago, and I bought it as soon as I saw it. It's a small set ($7.99) but packed with fun elements that you can use over and over. 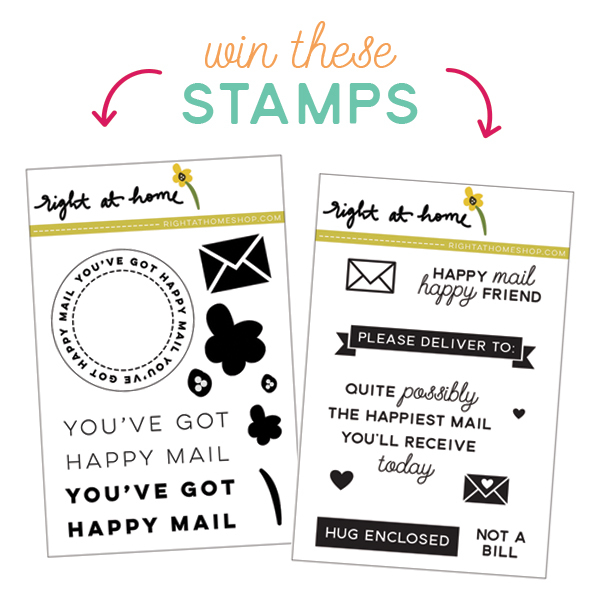 And, RAH just released Happy Mail 2, another great set that works perfectly with Happy Mail. RAH will be giving away a set of these stamps to a lucky winner. My card was directly inspired by this card, made by the uber talented Yana Smakula. Stamp a pattern in 3 or 4 shades of the same color and add a sentiment. I die cut the top layer to add some sweet scallops. Add a nice note inside and make someone's day. I used three shades of pink ink from Altenew -- Frosty Pink, Coral Berry, and Ruby Red. I used the Coral Berry twice -- once in full strength and once stamped off. The palest flower is Rose Gold ink from the Ton. My pad needs re-inking, so I got a great pale peachy color. flowers + gold = Yes, Please! Fantastic card! I love this cute stamp set & this pretty card! Flowers and gold: gorgeous! Seeing your card has definitely made MY day! Thank you! WOW Joan, this is amazing! 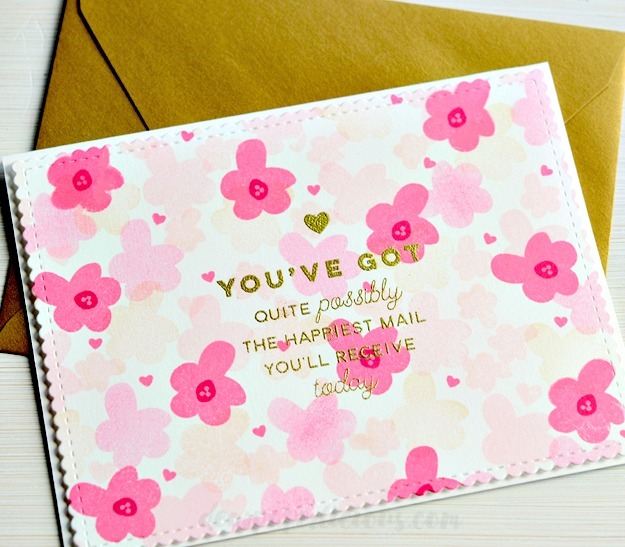 I love the gold sentiment and the pink floral background is gorgeous with it! Great work! i love this card! so sweet and adorable! =) thank you! I love this card! From the shaped edges to the pink and gold! Joan this is fabulous! Now I need this set to make happy mail! Super cute card! I can't wait to try something similar! Cute! I like the sentiment! Pink and gold - a winning combination! Pinks and gold so pretty!! And I LOVE the sentiment!! Hi Joan ~ I always love creating my own background paper and yours is quite lovely. The softness of the pink in contrast with the gold is wonderful on the doubled die cut card front. Thank you for sharing and inspiring. Such a pretty floral background! Great stamp sets! Fun, fun card with a happy background. A year already? I love this pretty thing! what a lovely card! I have to recreate this some time!! what die did you use to add the scallops? Lovely floral card, a very cheery message too. This is the loveliest happy mail ever! The floral background is so beautiful! 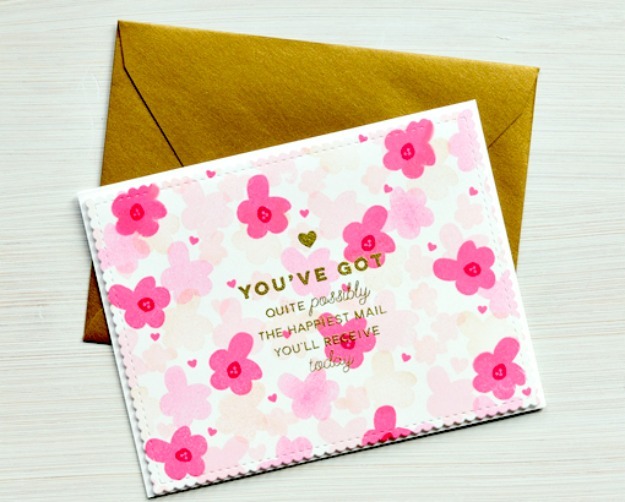 LOVE your card - that flower is fabulous! Gorgeous! Love the pink and gold!